(the weekend following Labor Day). Free educational family event open to the public! Saturday, 9/8 – Llama/alpaca Youth Show! Watch area youth compete in showmanship, performance, and costume classes. Know a youth interested in showing at Llamafest? Download entry form here. Show is Saturday, September 8, starting at 10:00 AM. Interested in being a sponsor for the youth show? Platinum: $100 or more: full page ad in show book, inclusion of flyer/coupons, banner/sign display. Gold sponsor: $50 – $99: half page ad in show book, inclusion of flyer/coupons. Silver sponsor: $25 – $49: business card ad in show book, inclusion of flyer/coupons. Bronze sponsor: $10 – $24: listing in show book. Use entry form to submit sponsorships. Take a llama for a walk and even try your hand on the obstacle course. Yarn and fiber products available for purchase. Win a felted soap kit if your name suggestion is selected. WNY Llamafest shared a post. Come visit with the Christmas llamas Saturday, 12/15, at East Aurora Carolcade, 7:00 - 8:00 PM. Reminder!! 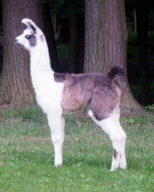 Entries for the WNY Llamafest Youth Show must be in by 8/24! Entry and sponsorship forms available at wnyllamafest.com/wnylf-youth-show. Come see us at Erie County Fair Thursday - Sunday (8/9 - 8/12). Star finally blessed us with this little guy today. 20 days late but worth the wait. Weighed in at 32.4 pounds. BC Steuben's Star Rising X LUA Sensational Status. This little gal joined the family today! Ten days late, but worth the wait. :-) Weighed in at 24.6 pounds.